Is God a Great Deceiver? A central tenet of creationism is that the earth (or even the entire universe) was created over a very short period of time, either six literal days or at most 6000 years, and that this creation was completed about 4000 BCE (see Creationism). Needless to say, this worldview is in utter disagreement with the findings of modern science, which pegs the age of the earth at 4.56 billion years, and the age of the universe at 13.7 billion years. Accommodating these indisputable facts in a creationist framework requires some rather tricky theological footwork. One such attempt was made by Philip Henry Gosse in 1857. In his book Omphalos, Gosse proposed the imaginative hypothesis that God had created the earth 6000 years ago, in accordance with biblical scripture, but this creation was complete with all the indications of an ancient origin and evolutionary history, right down to ancient-looking fossils embedded in rocks. His book was not well received -- commentators at the time rejected the theory as "too monstrous for belief" -- and the book faded into obscurity [Rogers2011, pg. 101]. This creation must have included all the chemical elements already organized in all the organic and inorganic chemical compounds and mixtures necessary to support the processes of the earth and of life on the earth. These processes include the phenomena of radioactivity. Did that star actually explode that many years ago? Or did God, only a few thousand years ago, make a self-consistent field of electromagnetic waves (including light) that has only recently given us the appearance of an exploding star? Here is another example in which there is an appearance of age. Creationist Jason Lisle rejects Holroyd's light-created-in-transit idea. He proposes various solutions, such as speculation that the speed of light has not always been constant, but in the end suggests that since stars were made during Creation Week by supernatural means, we need not be concerned with discrepancies in the time frame that has elapsed since then [Lisle2007]. R. Albert Mohler, President of the Southern Baptist Theological Seminary, "accept[s] without hesitation the fact that the world indeed looks old," but explains that the "appearance of the cosmos" is due to the "catastrophic nature of God's judgment upon sin" (perhaps suggesting that the earth and cosmos were altered by God to look much older as a result of the Fall of Adam) [Mohler2011]. The common thread of all of these theories is that God has deliberately constructed the earth and even the entire universe to appear old and the product of an evolutionary development, yet nonetheless it was all constructed a few thousand years ago, by supernatural means that are beyond the realm of humans, using all the power of 21st century technology, to uncover. While such a theory is superficially consistent with modern science, it is not falsifiable, since the theorized supernatural construction could just as well have occurred on Thursday two weeks ago, complete with all human minds intact, and we could not perform any experiment to demonstrate otherwise. More importantly, there are severe philosophical and theological problems with this notion, as we shall see below. It is worth pondering for a moment what the creationist "apparent age" theory, as taught by Henry Morris and others, really entails. Consider, for a moment, an ordinary piece of rock. Each speck of this rock must have been individually constructed with numerous long-lived radioactive isotopes whose relative concentrations are typical of multi-million-year-old material. Otherwise, by this point in time human researchers, using highly advanced equipment that can analyze even microscopic specks of rock, would obtain strangely discordant radiometric date measurements for many specimens of rock found in field studies (see Ages and Reliability). The same must be true of rocks throughout the world, even those at depths of thousands of feet below the surface, because these are within reach of petroleum drilling rigs and deep-earth mining operations. How many such specks of rock are there? If we consider specks 0.1 mm in size (and modern equipment, such as the SHRIMP ion microprobe, can analyze even smaller specimens), there are some 1030 (i.e., one quadrillion quadrillion) such specks within 2 km of the earth's surface. What's more, similar alterations must also have been made to all specks of rocks near the surface of the Moon and Mars, since spacecraft have measured the isotopic concentrations and other characteristics of these rocks as well. Careful measurements, using multiple well-established techniques, indicate that galaxy NGC5457 is approximately 21 million light-years from earth. Thus the light that a telescope sees was generated by stars in this galaxy 21 million years ago. Related techniques fix the distance to 3C253 at 2.5 billion light-years from earth (100 times more distant than NGC5457), so that its light was generated 2.5 billion years ago. Even at these distances, though, these objects emit enough light that they can be clearly observed through large telescopes. For instance, each second roughly 1016 (i.e., ten quadrillion) photons of light rain onto the earth's surface just from galaxy NGC5457. Since there are over 100 billion galaxies in the observable universe (some studies suggest up to 500 billion), the photon flux from distant galaxies to the earth's surface is some 1023 (one hundred million quadrillion) photons per second, even when one takes into account the fact that most galaxies are more than 100 times more distant than NGC5457 (and thus many times more faint). The total flux of light from distant galaxies heading to some point in the disk of the Milky Way (instead of counting just those arriving at the earth's surface) is roughly 1050 (one hundred thousand quadrillion quadrillion quadrillion) photons per second. But if the creationist view of astronomy is correct, then neither galaxy NGC5457 nor quasar 3C253 existed millions of years ago, since the universe was created in toto only about 6000 years ago. 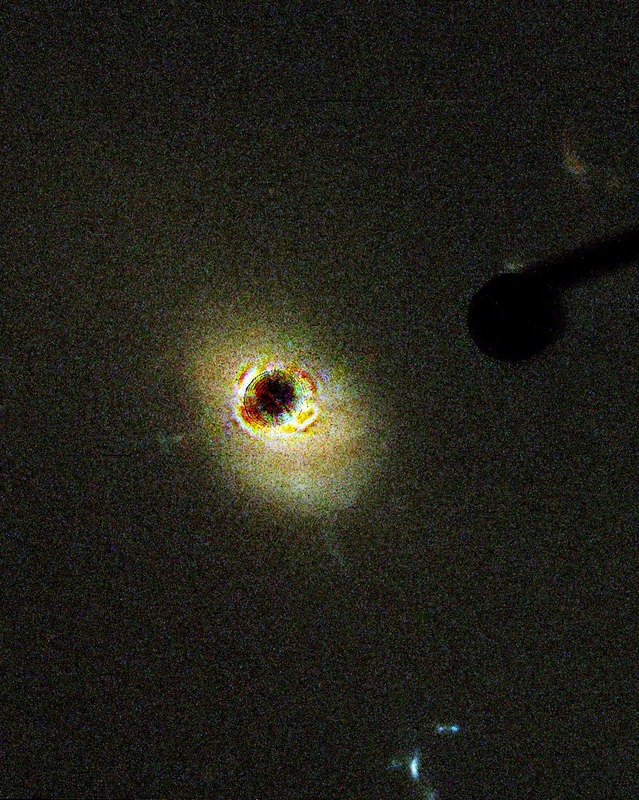 Thus the light we see today from NGC5457 was not generated by a real galaxy, and the light we see from 3C253 was not generated by a real quasar. Instead, if what what Henry Morris and some others have theorized is correct, a few thousand years ago God constructed countless quadrillions of photons in space, each heading directly to specific spots on earth (which is a moving target, due to its motion around the sun), so that in the 21st century our eyes and telescopes would "see" a galaxy and a quasar. Further, each of these in-transit photons must have been constructed with red-shifted frequencies typical of what modern scientists calculate would expect to see if these photons had been generated by natural processes many millions of years ago in real astronomical objects. Similar streams of photons must have been constructed in transit to earth from all of the hundreds of billions of other galaxies that astronomers can now see in large telescopes. What's more, since it seems inevitable that mankind will eventually embark on voyages to distant stars (and our robot spacecraft already have! ), then similar multitudes of photons in transit must have been constructed appearing to come from every distant galaxy and quasar on one hand, to targets throughout the solar system and throughout the Milky Way, wherever we or our robot spacecraft might eventually travel. If we reckon (as the creationists theorize) that the universe was created roughly 6000 years ago, we conclude that roughly 1060 (one quadrillion quadrillion quadrillion quadrillion) photons must have been constructed throughout the cosmos. However, almost all supernovas have occurred far outside the Milky Way, and thus are at least 200,000 light-years distant, so that when we see them occur we are seeing the record of an event that happened at least 200,000 years ago. 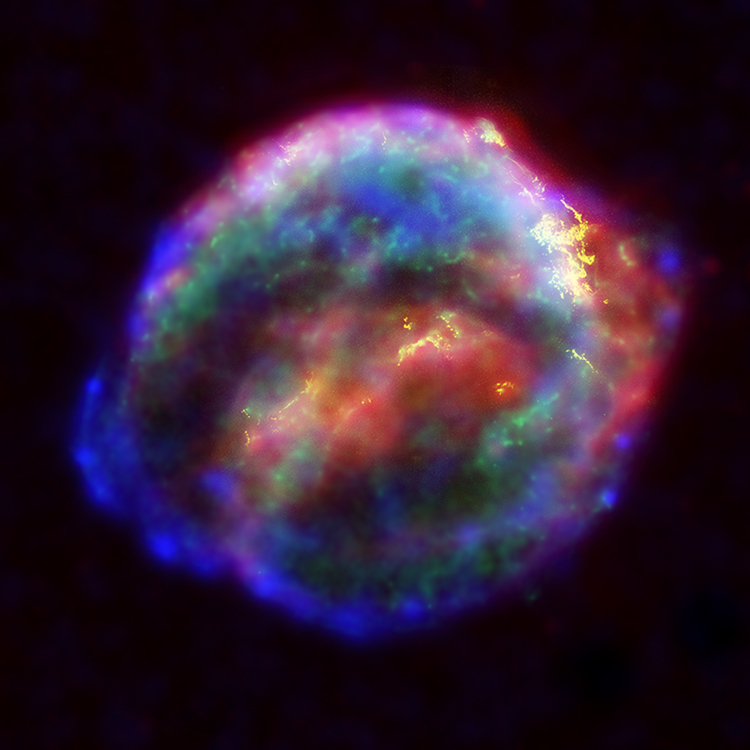 Type Ia supernovas are of particular interest to astronomers, since they can be used as "standard candles" to measure distances to deep space. For example, more than 2500 Type Ia supernovas have been observed by astronomers associated with the Nearby Supernova Factory at the Lawrence Berkeley Laboratory in California [Preuss2009]. More are being found in the Palomar Transient Factory (PTF), operated by a collaboration between California Institute of Technogy, the Lawrence Berkeley Laboratory and several other institutions (see PTF website). In August 2011 astronomers associated with the PTF project discovered the closest (and brightest) Type Ia supernova explosion that had been seen for many years. 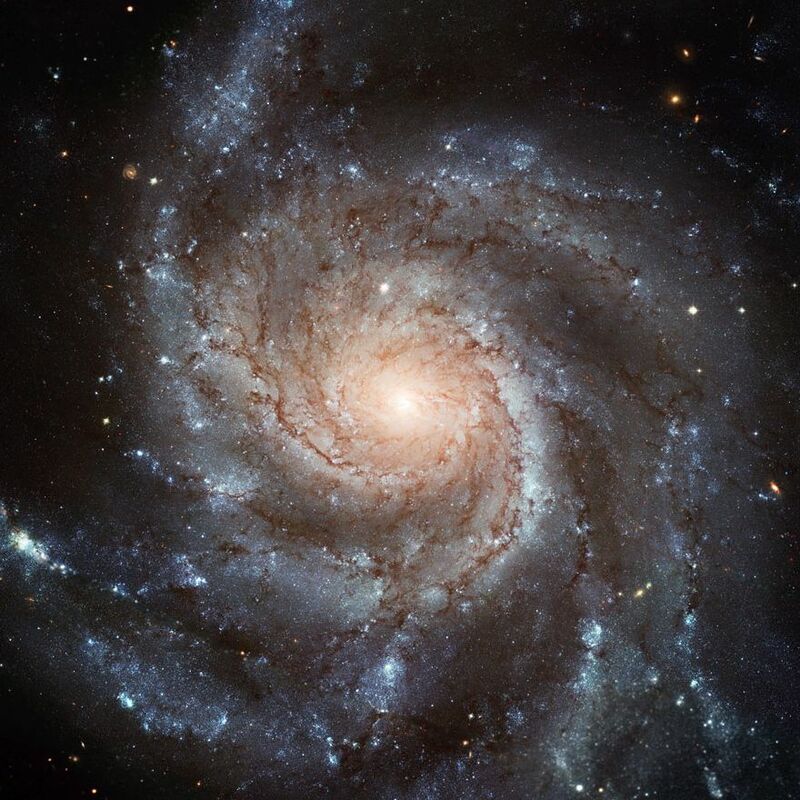 Since it was located in the Pinwheel Galaxy mentioned above, which is about 21 million light-years away, it occurred 21 million years ago [Vu2011]. Others are far more distant. In 2009, two supernovae were found that are 11 billion light-years away, so that they occurred 11 billion years ago, not long after the big bang itself, which has been dated to 13.7 billion years ago [Minard2009]. But for those who have embraced Henry Morris-style creationism, none of these supernova explosions really happened, since they occurred thousands, millions or even billions of years before the presumed creation of the universe 6000 years ago. In other words, according to the young-earth creationist worldview, all of these "supernova explosions" are nothing more than suggestive patterns of incoming photons constructed in-flight by an inscrutable Creator in roughly 4000 BCE. On the creationist hypothesis, each of these transposons represents an improbability that verges on the miraculous. Yet our data contain dozens of them. Furthermore, these transposons are distributed among the species in a highly non-random fashion. We saw on p. 28 [of Roger's book] that 16 transposons, scattered randomly among species, are exceedingly unlikely to be consistent with any tree at all. Yet even the reduced data set ... has 73 transposons, all of them consistent with a single tree. This requires another improbability of miraculous proportion. The creationist alternative is thus a matter of compounded miracles. One might argue that this is no problem because a deity can accomplish miracles. But if that is what happened, then I would submit that it was no accident. It must have been part of deliberate effort to convince us that humans evolved. Along this line, a research study found that there are some 50 trillion trillion trillion (i.e., 5 x 1037) DNA base pairs ("letters") among all the biological organisms presently on planet earth [Nuwer2015]. So the scope of the creationists' Creator's supposed alteration of DNA is every bit as staggering as the supposed alteration of the spectra of quadrillions of photons incoming from distant stars and galaxies, or the supposed alteration of the isotopic profiles of quadrillions of specks of rock in the earth's crust. Needless to say, there are severe philosophical and theological difficulties with the notion that God deliberately constructed a phony earth and universe to mislead diligent seekers of truth in the 21st century. Indeed, to most observers outside the realm of hard-core creationists, such a notion is not only absurd but downright blasphemous. It is utterly at odds with the notion of a rational, comprehensible God that has been the mainstay of Judeo-Christian theology for several millennia. Indeed, such a being would be utterly unworthy of our reverence or obedience. What saddens me is the view of the Creator that their intellectual contortions force them to hold. In order to defend God against the challenge they see from evolution, they have to make him into a schemer, a trickster, even a charlatan. Their version of God is one who intentionally plants misleading clues beneath our feet and in the heavens themselves. Their version of God is one who has filled the universe with so much bogus evidence that the tools of science can give us nothing more than a phony version of reality. In other words, their God has negated science by rigging the universe with fiction and deception. To embrace that God, we must reject science and worship deception itself. The image of God as a cosmic trickster seems to be the ultimate admission of defeat for the Creationist perspective. Would God as the great deceiver be an entity one would want to worship? Is this consistent with everything else we know about God from the Bible, from the Moral Law, and from every other source -- namely, that he is loving, logical and consistent? It is also worth pointing out that "God the Great Deceiver" theology goes against what the Bible itself says. Speaking about the creation, Rom. 1:20 states that God's qualities, in particular his eternal power and divine nature, are "clearly observed in what he has made." Psalms 19:1, that memorable verse which says "The heavens declare the glory of God," expresses the same idea. The "God the Great Deceiver" theory would have us believe the opposite. It is ironic that those who place so much emphasis on adhering to a literal, inerrant interpretation of scripture would ignore what the Bible plainly says on this essential point. There are major philosophical and theological problems with the creationist-intelligent design worldview, not the least of which is that it leads directly to God the Great Deceiver theology, a notion that well deserves the harsh criticism that it has received from numerous quarters. It is most unfortunate that a notion that was soundly repudiated in the 19th century should be revived and taken seriously by some in the early 21st century. What's more, such contortions are utterly unnecessary. It makes more sense, both scientifically and theologically, to simply accept the scientific explanation of the creation, and let religion focus on other, more fundamental aspects of the human experience. For additional discussion on this general topic, see Advantages, Design, Determinism, God of the gaps, Elevating and Natural law.